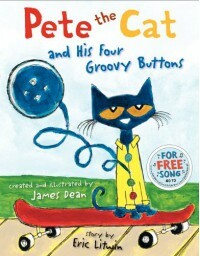 Pete the Cat and His Four Groovy Buttons draws readers along with Pete the Cat. This time Pete the Cat is wanting to go outside and play. However, a problem arises when Pete realizes he's missing a button! This book would be really good for Kindergarten through 2nd grade. I would read this with my future classroom and make it into a integrated lesson. After reading the book and going over some leading questions to help build comprehension, I would have the students help me create a coat by adding buttons. Simple right? Well our coats would have only the amount of buttons in the equations we are working on for each coat with 6 different coats to add buttons to.